Safety is our primary concern on every job site. 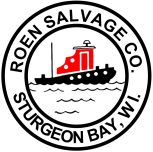 Roen Salvage Company has a team of professionals who actively handle the creation, implementation, and maintenance of our safety policies. All our job site supervisors have extensive safety certification training, and only those who have proven that they take the phrase "safety first" seriously in practice become supervisors. ​We constantly improve our policies and methods to stay on the cutting edge and provide the safest working environment possible. These policies are then refined for every project. As a result, our safety record is among the best in our industry. We provide our employees with paid safety training. This includes but is not limited to OSHA 30 Hour Construction Training, OSHA 10 Hour Construction Training, HAZWOPER 40 Hour Training, First Aid & CPR, Rigging and Signaling, MSHA, NCCCO, and Welding. We perform background checks on all new hires and confirm that they do not have a history of unsafe behavior. Our policies meet or exceed the safety requirements of OSHA, the U.S. Army Corps of Engineers, and the U.S. Coast Guard. Our safety record allows us to work with these agencies as well as some of the strictest private clients. This safety record is yet another reason so many of our crew have made their career here and plan to retire here.